President Bush outlined a $7.1 billion strategy Tuesday to prepare for the danger of a pandemic outbreak of avian flu. The plan gets mixed reactions from some health experts. St. Paul, Minn. — (AP) - President Bush outlined a $7.1 billion strategy Tuesday to prepare for the danger of a pandemic influenza outbreak, saying he wanted to stockpile enough vaccine to protect 20 million Americans against the current strain of bird flu as a first wave of protection. The president also said the United States must approve liability protection for the makers of lifesaving vaccines. He said the number of American vaccine manufacturers has plummeted because the industry has been hit with a flood of lawsuits. Bush said no one knows when or where a deadly strain of flu will strike but "at some point we are likely to face another pandemic." There are no cases of avian influenza in North America yet, and so far the virus spreads only between animals or from animals to humans. But scientists predict the virus will mutate into a form that spreads from person to person. That could create a deadly global pandemic. Bush has called for coordinated monitoring of outbreaks around the world, and more vaccines. The plan includes $1.2 billion to buy doses of an existing flu vaccine. It might help; it might not. Scientists can't develop an avian flu vaccine that targets the mutated virus until there's a pandemic. President Bush also wants to stockpile anti-viral drugs. 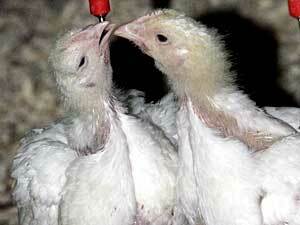 They can't prevent the disease, but would lessen the effects of avian flu. He's called for 20 million doses of the anti-virals to treat first responders and health care workers, and other at-risk populations. Minnesota's chief epidemiologist Harry Hull says the plan is comprehensive. "If the president and Congress can come together and fund this plan over a multi-year basis, I think it will advance our preparations tremendously," Hull says. We have to take better care to think about this problem all the time. Not just catch-as-catch-can. Flu today, SARS tomorrow, always in crisis mode. That doesn't work. Hull isn't sure what it will mean for a state like Minnesota in terms of funding. But he says the state is already better prepared than most, because of past work targeting bioterrorism. There are already plans to distribute antibiotics and vaccines around the state quickly. The president's plan carries a huge price tag. One of the largest chunks of money would go to vaccine research -- $2.8 billion. That encourages David Topham, an assistant professor of microbiology at the University of Rochester. Topham studies how influenza is transmitted from one person to another. He says the president's plan is good because it focuses on practical responses. "As a researcher, I read that as they're going to put money into basic research so that we can develop better vaccines, more efficient vaccines, and better ways of manufacturing them," says Topham. Topham says vaccine development is very slow now, because it depends on the supply of fertilized chicken eggs for research and production. Bush has suggested using research money to develop alternative technologies for developing vaccines. While some are happy with Bush's plan, saying they've been wanting for something like this for years, others think it misses the point. "I see a report that could be written by a CEO of a company, a mission statement, (such as) McDonalds. 'We will serve tasty food.' 'We will prevent epidemics.' Well, OK. How?" asks Howard Merkel, a professor of communicable diseases at the University of Michigan. Merkel heads the school's Center for the History of Medicine. He says Bush's plan for the most part outlines the basics, but lacks detail. He adds, there's a glaring omission -- the plan says nothing about improving the public health infrastructure around the country. Merkel says it's not too late to prevent a pandemic, but it's the type of thing government should always think about. "We have to take better care to think about this problem all the time. Not just catch-as-catch-can. Flu today, SARS tomorrow, always in crisis mode. That doesn't work," says Merkel. "If you look at the history of epidemics, the one consistent thing that comes up time and time again, is that communities that take concerted effort to plan in advance do a much better job at containing an epidemic, not to mention treating them." Merkel says we're probably not prepared to distribute all of the vaccines Bush wants to produce, since we don't have enough doctors, nurses, or even hospital beds. "And that is a problem right now. If we were to have a true avian flu pandemic ... could we take care of all those who got seriously ill? The answer probably, in a place like St. Paul, Minnesota, or Ann Arbor, Michigan, where I live, is no," says Merkel. Avian flu is still an ocean away, but most experts say it will arrive at some point. For now, Merkel says there's a simple thing everyone in the U.S. can do. Go to your doctor or a public clinic and get a regular flu shot.